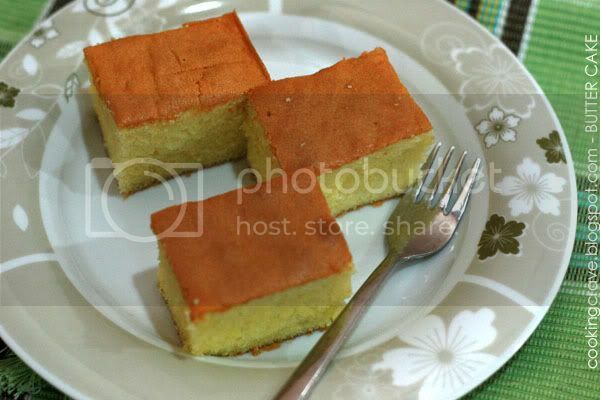 I have several recipes of Butter Cake and I found this one is the BEST among all. 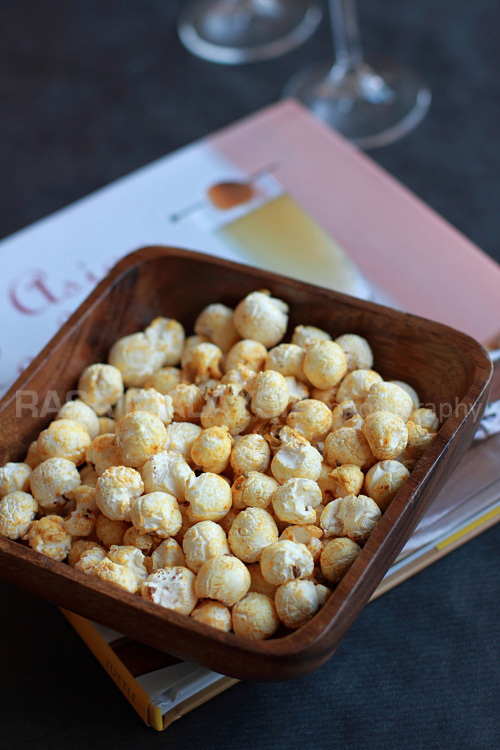 Moist, very buttery taste and soft. This butter cake recipe is definitely a keeper. Try it out and let me know the result ok? Each time when I get to know that there will be guest coming to visit me. Butter Cake will always be my first choice as I know it'll be well accepted by most of us. Kids love it so much, adults and elderly too. It's perfect for tea-time while chit-chating with group of friends ~ yum...yum! My favourite butter brand for baking...! Preheat oven at 175'c. Grease or line the 8" baking pan. Sifted together flour and baking powder. Set aside. Beat together butter, sugar, salt and vanilla essense until creamy and light with mixer. 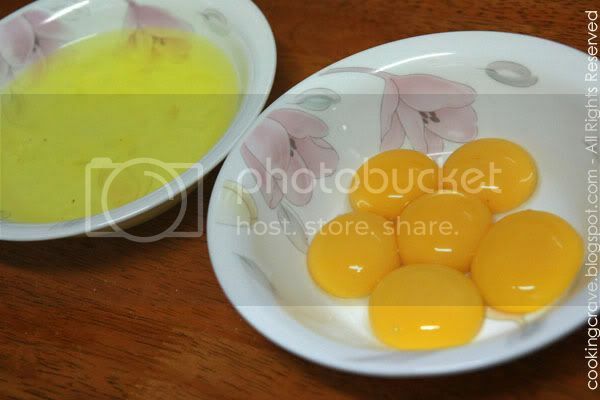 Add in egg yolks, one at a time and beat until creamy. Add in milk and mix well. Fold in the sifted flour slowly spoon by spoon into mixture till well mixed. In a separate clean bowl, whisk eggs whites till foamy then add in sugar gradually. Beat to a soft peak and fold 1/4 into butter mixture. Mix well and fold in the rest. p/s: I bake bigger cake using 25" x 30" retangular cake pan and use 1 1/2 recipe stated above. I bake my cake at 160'c as my oven temperature tend to get too warm and will burn top of my cake. Long time did not make butter cake. Yours look good. Will add this in my to do list. wah! !today u bake 1 more?? why don't u call me go ur house n collect it...ha! ha!!! yesterday 1 all finish by my child. Hahaha..I didn't bake Butter Cake today. That is the pictures I took when I bake the cake 2 days ago. Today, I busy take down my curtain to wash and wipe the windows. My first time see a butter cake recipe using egg separation, this recipe really taste better than the normal one? If yes, I gonna to give a try. Thanks for sharing. Sonia: You must try this. I bake this cake the other day and give some to my friend and the cake finished by her children. This cake is yummy, you have to monitor the oven temperature and don't overbaked it. It's soft and moist!! Wow, your butter cake looks moist and nice. ♥peachkins♥ ：Thank you. Ya, it's creamy, moist and soft. cherry potato : Thank you. Try it out and let me know the result. seems like you've come back with some good treats! I've never used this brand of butter.. Is expensive? 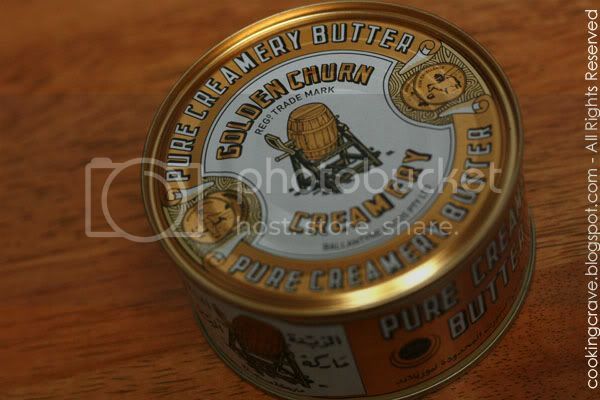 tracieMoo: I bought this canned Golden Churn Butter 340g for RM9.90at a shop selling bakery ingredients here. They sold it at RM10.90 in shopping malls. Golden Churn Butter is the best for butter cake! Your butter cake looks so moist and delicious , will try your method soon , thanks for sharing ! This looks good, Amy! I miss coming here and baking too...sigh.. i hope i get some time soon... miss chatting with you too. Wow you have a fantastic blog! I love your photos! All the food looks so good! looks so moist and delicious, you are a great baker!!! I tried baking this butter cake last evening but the base of the cake looks a bit wet. However, it still taste as good. Try it today.Best cake ever. Soft and not too sweet. Thanks for the marvelous recipe. can i add in some chocolate chips to the it before baking. Will that ruin the cake? Cotton Cheese cake method with butter cake method.. excellent! hi, may i know if i use an 8" pan, the pan has to be how deep? ?